It’s been a golden end of summer as we’ve moved into the most delicious autumn we’ve been able to recall in the past number of years. We’re enjoying sunny, warm afternoons on the playground, reading some brilliant new books about seasonal changes and watching our Kindergarten children grow, change and mature. We knew that post-Thanksgiving is a special time as we watch our classes take significant step forward in their self-regulation. We’ve really worked hard on our self-regulation strategy of deep breathing. Most of the children realise how good it feels to breathe deeply and feel their bodies relax and become more peaceful. This week, we’re solidifying our routine by including the Zenergy chime as part of developing mindfulness. After listening to quiet music to calm ourselves (right now we’re listening to a personal favourite, “Deep in an Ancient Hawaiian Forest” from the movie “The Descendants”) we play the chime once and think about the sound. We’re training our brains to focus. We lead the children through a deep breathing sequence, and then play the chime a second time. The children are learning to gently push away small noises they might hear, concentrate on their breathing and have a few moments of meditation when their mind can simply relax. The most important take-away from this strategy is that the children know their breath is their friend – it’s always with them, it can help them to calm down, relax and be refreshed no matter where they are. Next week, we will start to discuss our emotions and feelings and the importance of sharing how we feel with others. We worked on upper and lowercase D this week. 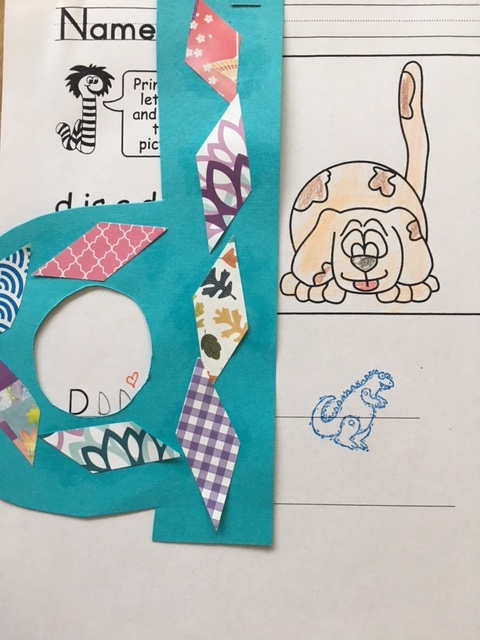 Lowercase “d” can be tricky because many children confuse it with lowercase “b.” When practising printing at home with your child, remember that we print all letters left- to right, top to bottom. For lowercase “b” the stick is printed first (the left side of the letter) from top to bottom, then the circle is formed (the right side of the letter). Both parts of the letter must touch without crossing over. For lowercase “d” the circle is formed first (the left side of the letter), then the stick is printed from top to bottom (the right side of the letter). Both parts of the letter must touch without crossing over. Printing is all about precision, and so we strive to teach the children to at least try to form the letters correctly. Forming the alphabet letters correctly will actually help your children to print neatly and quickly (this will become apparent and necessary as they move through the grades), and surprisingly, requires less energy so printing is not a tiresome task. It goes without saying that it takes years of practise to have beautifully formed letters that sit on the line, with consistent size and spacing. Each child arrives at this point when they are developmentally ready and is greatly influenced by their pre-printing experiences such as colouring, drawing and other fine motor play including playdough and Lego. As classroom teachers, we recognise that each child has a different style to his or her printing and it’s exciting for us when we can identify a child’s piece of work without looking at the name printed at the top of a page! We made these beautiful tissue paper apples last week. We finally have everyone’s finished and up on the bulletin boards. Are these not absolutely amazing? 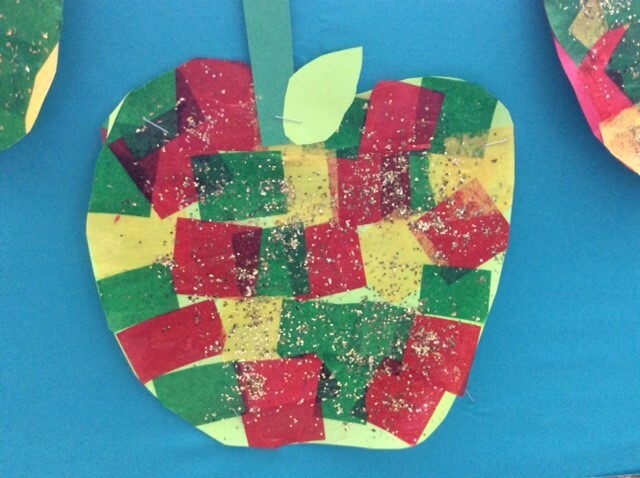 The children separated small pieces of tissue paper (we’re always looking for activities to strengthen small fingers for strong fine motor skills) and glued them onto their apple cut-out. Some mod podge and a whole lot of gold, red and green glitter later…well, if you could see how they capture the light in our room, they are breathtaking. As part of our personal identity unit in Social Studies, we’ve been doing a lot of activities around our names so this week we thought we’d expand our knowledge and start to chat about our last names. This discussion proved to be a little more challenging for our classes because not all the children have necessarily been required to say their last names very frequently and were a little shy to talk about it. We think this is an important opportunity for you to talk about your family name so your child feels more confident in stating both their first, and last names. 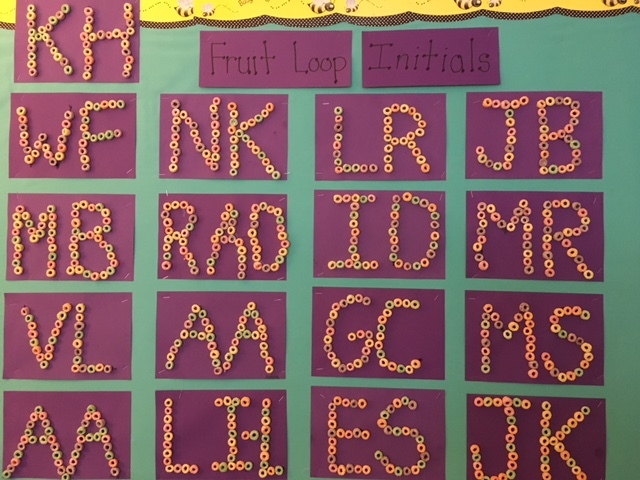 For our class activity, we created our initials using fruit loops. The classroom smelled really good, and the children were very respectful about not sampling the fruit loops. (Telling them that some of the fruit loops were left over from last year, and had been touched by MANY MANY hands, may have somewhat dampened their enthusiasm for tasting. But our conscience is clear…we’re telling the truth). 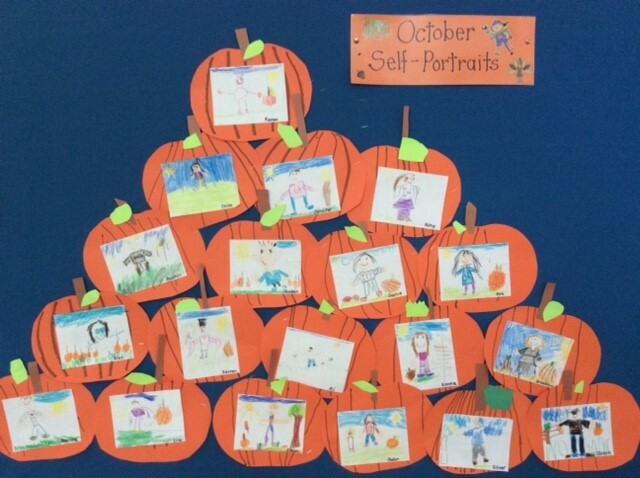 We completed our October self-portraits with these cute pumpkin backgrounds. It’s only our second self-portrait this school year and we are delighted with the children’s drawing, cutting and glueing skills. Our Kindergarten children have completed a lot of fantastic work this week. We’d say that so far, this year’s harvest has certainly been one of plenty. Friday, October 20 is a Professional Day; students are not in session. Monday, October 23 is a Curriculum Implementation Day; students are not in session. Sharing and Special Helper: we’re starting another round of Special Helper soon and we’re ready to include Sharing. Sharing is similar to the former “Show and Tell” but we will be giving a specific theme to follow each month. Our theme this time is going to be “Bring 3 Objects that Begin with the First Letter of Your First Name.” All three items must fit in a small ziploc bag. We’re quite strict about that rule so please help your child to locate the appropriately sized items; your child should know the names of what he or she has brought to school. Please Note: if your children forget to bring their Sharing on their Special Helper Day, we will not be allowing them to bring it on another day. We’ve done this in the past and it frequently results in a backlog of Sharing and takes away from the child whose Special Helper day it really is. Please check the posted calendar for your child’s Special Helper Day.